You just launched a big Facebook advertising campaign, only to get a load of nasty comments posted on your ad. You shelled out big money on an AdWords campaign — only to find that all those clicks weren’t correlated to even a single new member for your health club. You decided to switch to online SaaS self-serve account maintenance — and this vendor’s platform has more downtime and glitches than you thought were even possible. Now, you’re sitting there feeling like a failure, wishing you could hide. Let’s face it: most of us are afraid to fail. In fact, we’re petrified. We think failure is a reflection on our wisdom or intelligence, a sign of weakness, or simply an indication that we stretched too far in trying to succeed, and bit off more than we could chew. But think about this: years ago, when SpaceX founder Elon Musk’s Falcon rocket blew up on the landing pad — for the third time in a row — he didn’t go into panic mode. Instead, he welcomed the opportunity to learn why it was so difficult to land a rocket vertically, and gathered as much data as he could on why each of the landings failed. Each time he learned something. About the O-rings. About the hydraulics on the landing struts. About landing control systems. It’s much smarter to follow Musk’s example and reframe failure as a series of learning opportunities that help you get better, faster. The only way to really find out if an idea is a good one is to try it. 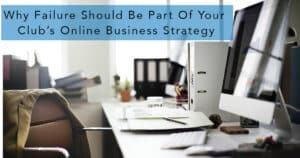 Sure, it makes sense to do as much research as possible before starting or expanding a new class, training program, product, service, franchise, or sales and marketing strategy. For example, before you hire a team to build out a pay-per-click marketing campaign to attract guys to your weight loss program, research gender differences related to weight gain, loss and maintenance and behavior change in general. Before you develop the editorial schedule for your blog and Facebook posts, talk to your male customers about what they do and don’t like about their experiences with weight loss. But realize: eventually, you have to make the jump — launch the campaign and write the posts. The good news is that since it’s digital, whether people click and comment and share or not — you’re going to end up with a vast amount of useful, valuable data. Gather and analyze as much of it as you can — Facebook and Instagram engagement stats, Yelp and Google Business details, details of organic and paid website visits, conversion analysis, clickthrough on search ads, banner ads, data from promoted posts, remarketing results and so on. We use online tools like Agency Analytics and Klipfolio to do deep-dive analysis of web, email, and social data channels, but Google and Facebook provide decent entry-level analysis and access to more data, sliced more ways than most people will ever use. Remember, your club’s “marketing experiment” isn’t unproductive as long as you learn something from it! Before you embark on a new online marketing initiative, do your homework. Use tools like Google Analytics and Facebook Audience Insights to understand your current and prospective clients and members better. Other resources, from Census Bureau data to resources like the free ones on this list can help you dig up even more info. Extensive market research is available into consumer preferences, wants and needs for virtually every corner of health and wellness. Keep in mind, however, that you will still have many important unanswered questions even after you’ve gathered mountains of facts, figures and insights. No matter how much data you gather, there will always be more. No matter how much research you do, the most important questions can only be answered through actual experience. And even a clear best choice brings risks, trade-offs and opportunity costs. If you decide to double-down on video marketing, you may not have the budget for simultaneous Adwords campaigns. Analyze the pros and cons of your best two or three choices, estimate the financial and operational numbers, build a contingency plan — and get going! Yes, failure is always a possibility when you try something new. But it is a near-certainty if you do nothing. Taking a risk forces us to think hard about just how much business risk — and how much potential failure — we can accept. There’s failure, then there’s epic failure. Know the difference. Not all of us can afford to blow up a billion-dollar rocket just to test the design. Can you afford the time and money to experiment with a pay-per-click, radio and print advertising campaign to connect with folks with disordered eating behaviors like emotional eating or stress eating? If your research says that’s a demographic that aligns well with your healthy lifestyle program, probably so — assuming your business has the resources to survive the ramp-up period to build your sales funnel. Should you switch from women’s weight loss to fight club-style fitness training and invest in a new website, a Facebook Business Page overhaul, a new logo and a fresh start on your AdWords campaigns? That’s a bet-the-farm risk in many wellness businesses. The customer mindset will be different, the same business probably can’t be an expert in both without analyzing and re-inventing or hiring new employees with new skills, and even research may not tell you how big your market opportunity is. It’s certainly possible to succeed at something entirely new, even radical: the question to ask is whether failure could kill your business, and whether you’re willing to accept that risk. After DNFing at Ironman Galveston 70.3 after a bike flat from a broken bottle, I made a list of what I’d do differently next time. Avoid the road’s shoulder. Pack an extra tube. Put Pit Stop tube sealant in my seatbag. Switch to GatorSkins. Learn to fix a flat under pressure in less than 5 minutes. When I finished my next half-iron, my best performance time was on the bike — the same area where I’d failed earlier. Lesson learned. Digital marketing works the same way. Anticipate what can go wrong and develop contingency plans before you need them. What will you do if you get a nasty comments on your Facebook ads? What will you do if your well-intentioned New Year’s membership promotion results in a huge number of spam reports to your email provider? How will you make sure that a new ad campaign actually generates results and not just spending? There is always the chance you will fail no matter what you do. Ironically, accepting that reality, and planning for it, greatly reduces the likelihood that it’ll happen. A certain amount of failure is not just inevitable, but necessary for your business to make progress in its goals. You cannot know whether your marketing should focus on social engagement, display ad impressions, or containing search ad bid estimates without seeing the data. You cannot always know the size, mindset, or purchase-readiness of your actual target market without trying to reach it first. You often can’t develop productive leads without gathering both productive and unproductive leads and going through a culling process. It’s important to know — before you eat through that business loan — whether your text-message based lifestyle change program will appeal to clients, and whether Instagram is really the answer for your target audience. Research and quantify the risks, costs, and options. Compare options and choose your next step proactively. Consider timing. Is December really the best time? Take a calculated risk, based on the level of risk you can accept. Set an end date for your marketing experiment. Don’t end it early, and don’t drag it out. The goal is to get data, analyze, and draw conclusions. Collect the data, analyze it, and draw conclusions about why it did or didn’t work. This is the due diligence you owe yourself, your employees, your investors, and your potential customers. Like other elements of your company’s business strategy, failure should have a time and money budget. Too many failures too quickly may drain your finances and expose your business to stresses it may not be able to survive. Too few failures, and you’re stuck in a rut. The amount of “failure” your wellness business can tolerate depends on a mix of factors: financial exposure, lost opportunity, reputational risk, and your management team’s and investors’ risk profiles. Much like kids who fall off bikes, you can let failure teach you to avoid riding, or you can let it teach you how to get back in the saddle and forge ahead.